Ready to step it up a notch and challenge yourself at a more technical white water rafting experience? Canada Fall is the river for you. The South Branch of the Penobscot River Canada Falls section is located in the scenic and wild North Maine Woods. Our Canada Falls rafting day trip offers personalization to the extreme, since you will experience a day of whitewater rafting, with no crowds, just rumbling whitewater in the pristine wilderness of Maine. Canada Falls is a class V river, with steep drops. The whitewater excitement builds from the rafting launch to the take out. Get loosened up in the class III rapids until you hear the thundering rumble of a 20 foot waterfall called The Slide! As the whitewater excitement builds there are rapids with names to challenge your guide’s decision-making at Upper and Lower Split Decision, technical, must make moves and hydraulics around every turn. Canada Falls is a unique, one of a kind, white water rafting trip, since it is only run on Saturday’s during the summer. Join a pioneer of Canada Falls river rafting when you whitewater raft with Northeast Whitewater on the class V rapids of Canada Falls. We raft this river twice, so you will experience double the class V’s, double the thrill and guarantee double the white water rafting Maine excitement. Saturday whitewater rafting on Canada Falls fills up fast, so give us a call to reserve your next thrill of a lifetime. If you’re ready for Canada Falls, than Canada Falls is ready for you on Saturday scheduled release days. Northeast Whitewater provides all the equipment you need for your Canada Falls whitewater rafting trip, including state-of-the-art self-bailing rafts, Type V lifejackets, paddles, helmets and safety equipment. Wetsuits are available at an additional cost and are required on some whitewater rafting trips. Every boat on a Northeast Whitewater Canada Falls whitewater rafting trip is helmed by a Registered Maine Guide. 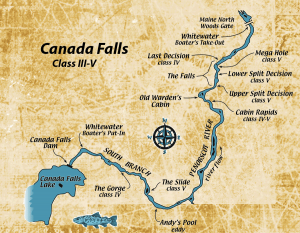 Northeast Whitewater provides the local transportation for your Canada Falls raft trip. A user fee of $18.00 to cover road access to the South Branch of the Penobscot River and a State of Maine head fee is added to each whitewater rafting guest. 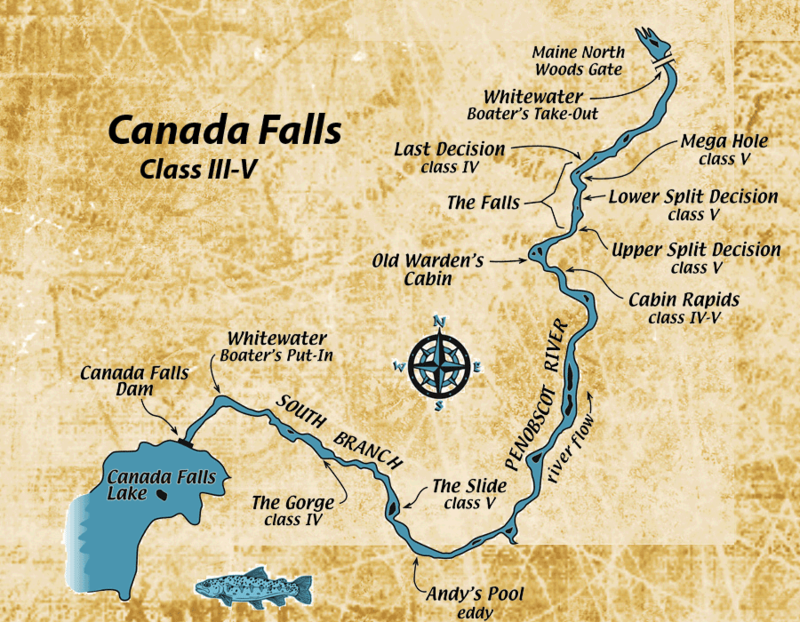 All Canada Falls rafting trips meet at the Northeast Whitewater Moosehead Lake Basecamp at 8am. Our famous river lunch is included in your Canada Falls whitewater rafting adventure. Northeast Whitewater screens a photo slideshow of the day’s whitewater rafting adventure (available for purchase). Video is available on any Canada Falls whitewater rafting trip at an additional cost and must be requested in advance. We pride ourselves on small, personalized trips. Northeast Whitewater requires a minimum of eight participants on guided Canada Falls whitewater rafting trips. If your party is less, you can join an existing whitewater rafting trip. Sport Rafts are available for all Canada Falls whitewater rafting trips. Sport Rafts are the smallest rafts on the river. Everything looks and feels bigger. Sport rafts guarantee that you will have your own raft, and are driven by only the most experienced Northeast Whitewater Registered Maine guides. Just wanted to drop you a short note to say thank you and let you know that I had a great time. I had never been rafting before and did not know what to expect. You and your guides make the experience relaxing and enjoyable. Once again thank you and I look forward to going rafting again.